Pipelines are the safest means of moving large volumes of liquids. Transporting petroleum products via the Pilgrim Pipeline is far more environmentally friendly than relying on trucks or fleets of traditional barges. In fact, the spill risk for barges is almost seven times greater than that for pipelines. Based on an analysis of EPA and state data, the estimated annual total emissions of GHGs (in CO2e) for transporting the crude and refined products via Pilgrim Pipeline are approximately 20% lower than transporting the same volume of crude and refined products by barge. Overall, the pipeline option does not represent a significant source of GHG emissions, and, by relieving congestion caused by transporting products by teams of traditional tankers and barges, and eliminating the tons of pollutants associated with these forms of transportation, the Pilgrim Pipeline will produce a net air quality benefit to the region. 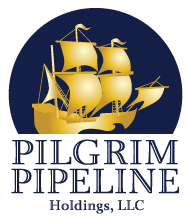 The Pilgrim Pipeline route will utilize existing transportation and utility corridor in both New Jersey and New York. Where applicable, environmental impact of the pipeline will be mitigated by use of directional boring, an innovative trenchless technology that involves no surface impact.